The first tool developed for supporting users in the creation of semantic RESTful service descriptions. This website presents SWEET, first tool developed for supporting users in creating semantic RESTful services by structuring service descriptions and associating semantic annotations with the aim to support a higher level of automation when performing common tasks with RESTful services, such as their discovery and composition. Insertion of hRESTS microformat tags in the HTML service descriptions in order to mark service properties (operations, address, HTTP method, input, output and labels). Integrated ontology search for linking semantic information to service properties. 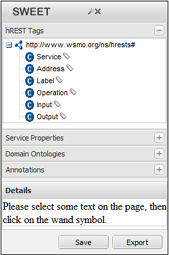 Insertion of MicroWSMO model reference tags, pointing to the associated semantic meaning of the service properties. Saving of semantically annotated HTML RESTful service description, which can be republished on the Web. Extraction of RDF MicroWSMO service descriptions based on the annotated HTML. Posting of semantic descriptions to iServe, where they can be browsed, searched and resued. iServe is a platform for publishing Semantic Web Services as linked data, no matter their original format (try the iServe Browser). iServe builds upon the Web of Data principles and uses as its core what we refer to as the Minimal Service Model, a minimal vocabulary for describing services in RDF, which abstracts away from the original approach used for annotating the services, such as SAWSDL, WSMO-Lite, MicroWSMO or OWL-S. When posting semantic descriptions created with SWEET, the RDF is directly converted to the minimal service model and is stored together with the original MicroWSMO description. Demo of the newest version of SWEET is available Here. Acknowledgments: The development of the SWEET tool is based upon work partially supported by the EU funding under the project SOA4All (FP7 - 215219). In addition, we thank Laurian Gridinoc and Simone Spaccarotella for their contribution to the development of SWEET.